Tadpoles and Psychic TV alumnus David Max emigrated from the States to Switzerland a decade or so back since when he’s released the underrated Simple Psychedelic Pleasures and has now collaborated with Nick Nobody on this his latest project. 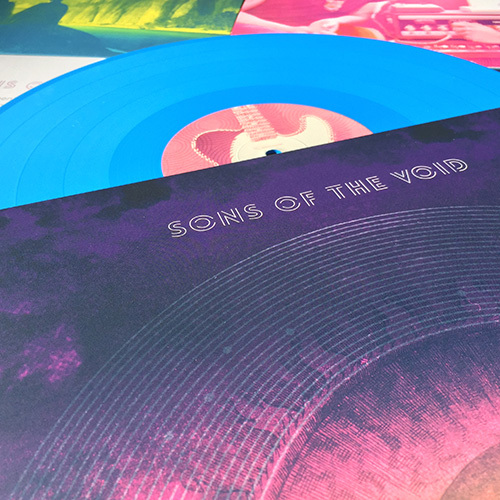 Sons Of The Void provides a welcome antidote to the crushing weight of drone and stoner-rock that constitutes so much of the psychedelic listening experience these days. By turns playful, inventive and melodic, tracks like the opening ‘Leichenblume’ (corpse flower), ‘Absorption’, ‘Little Children’ particularly ‘The Things We Wish’ feature sparkling arrangements pitched somewhere between latter-day Fabs and a slightly unhinged Byrds. ‘A Kick Like That’, meanwhile, is a lush, swirling affair apt to wander off in a world of its own. It’s the highlight of an impressive collection of tunes delivered with deftness of touch and more than a few neat hooks. We need more of this, really we do.